(Left to right) Anna Paulina, Antonia Okafor, Amy Robbins, Xena Amirani. 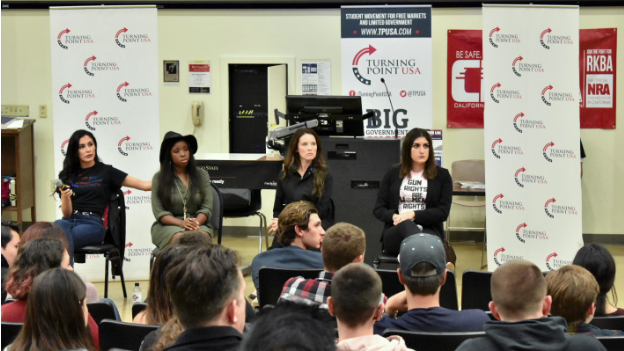 The San Diego State chapter of the conservative student organization Turning Point USA hosted their first event on campus, a panel titled “Gun Rights are Women’s Rights,” on Nov. 8. The event featured an all-female panel consisting of four Second Amendment activists: Anna Paulina, Antonia Okafor, Amy Robbins and Xena Amirani. The four argued in favor of guns as the ultimate deterrent to violent crimes and sexual abuse towards women. SDSU’s Turning Point USA President Skyler Shibuya began the event with a moment of silence in response to the shooting in Thousand Oaks, Calif., that took the lives of 12 people in a country bar just a day prior to the panel. Shibuya said the shooting was personal to him, given that one chapter member personally knew victims of the massacre. Shibuya said he wanted to host a pro-Second Amendment event in the wake of the suspension of the Del Mar gun show. He was inspired by hosting an all-female panel when he was researching gun rights activists, stressing the importance of conservative groups to highlight underrepresented communities. Two activists, Paulina and Okafor, cited first-hand experiences in arguing in favor of gun rights. Paulina described how past burglaries perpetrated by her landlord convinced her to apply for a concealed carry permit. Okafor, a survivor of sexual assault, argued the Second Amendment is an authentic reflection of feminism saying female students facing threats of sexual assault on college campuses would be better protected by the Second Amendment. Amirani, a 19-year-old USC student, started the “March for our Rights” organization to represent future gun owners of America. She described the numerous crime reports she receives daily from USC campus police in Los Angeles, a city with strict gun ordinances. Amirani raised additional concerns over state efforts to raise the legal age of gun purchases from 18 to 21, a regulation that wouldn’t account for young women who live alone or law-abiding citizens. All four women criticized modern feminism for failing to empower women. Paulina, in arguing in favor of women bearing arms, said women and men are “biologically different” and argued women could feel more confident knowing a firearm could stop a potential threat. Okafor and Amirani criticized campuses that banned mace and other forms of self defense. Okafor called firearms “the great equalizer,” advocating for any tool women can use at their disposal to defend themselves. The event drew a crowd of over 100 people from multiple sides of the political aisle. Junior management information systems student Benjamin Cunningham attended to inquire about solutions to shootings across America – with the hope that liberals and conservatives could come together to prioritize solutions and tackle political polarization. Junior psychology student Jonny Ramon said he attended because he felt political events are important to enrich his college experience. He also said the event was personal to him as a conservative student. “(It’s nice to know) there’s a group on campus that you can go to and not get chastised the moment you walk through the door,” Ramon said.